Genetic studies have shown that the journey of human evolution began around 85 million years ago, when primates diverged from other animals. The earliest fossils discovered of the first primates have been dated to around 55 million years ago. The African great apes appeared around 14 million years ago and the ancestors of humans began standing upright between 4 to 7 million years ago. The loss of body hair began between 2 and 3 million years ago and Homo erectus evolved in Africa around 1.8 million years ago. Homo sapiens are thought to have developed out of Homo erectus between 1.8 million and 200,000 years ago, and modern humans emerged shortly thereafter; between 100,000 and 200,000 years ago. Charles Darwin created the hypothesis that humans have a single origin in his 1871 work Descent of Man. Through researching mitochondrial DNA only inherited from the mother, geneticists later proved that all modern humans today are descendants of a single woman who lived around 200,000 years ago, nicknamed the “mitochondrial Eve”. A more recent study in 2013 found that all human males share a single ancestor in Africa roughly 125,000 to 156,000 years ago, and that all human females trace back to the mitochondrial Eve who lived in Africa around 99,000 to 148,000 years ago. Fossil evidence as well as genetic evidence shows that archaic Homo sapiens evolved into today’s modern humans solely in Africa between 100,000 and 200,000 years ago. By 60,000 years ago, one branch of these humans over time left Africa and spread across the globe, replacing the earlier human populations of Homo erectus, and also the Neanderthals, who went extinct 40,000 years ago. All humans today are descendants of this group of humans that came from Africa some 60,000 years ago. An important point to note here in terms of evolution and ‘race’ is that humans are so closely related in terms of time and evolution, that there simply hasn’t been enough time for humans to separately develop and to create any differences in terms of intelligence, behavior or any type of speciation. When humans first ventured out of Africa some 60,000 years ago, they left genetic footprints still visible today. 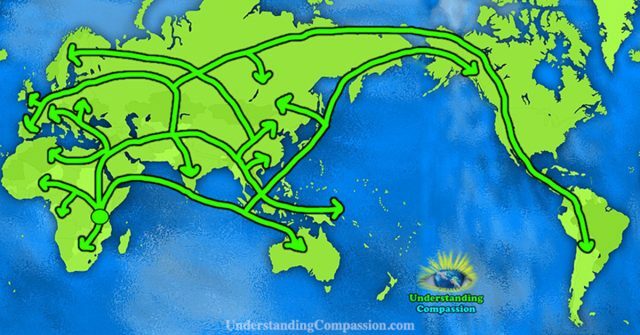 By mapping the appearance and frequency of genetic markers in humans today, we’re able to see a path of human migration showing when and where humans moved around the world. Over an evolutionarily short period of time, these migrations eventually led the descendants of a small group of our African human ancestors to settle in every corner of the Earth. Throughout this evolutionarily short period of time, humans have traveled and interbred across all populations, and as humans moved from place to place, meeting and copulating with their neighbors, genes too moved from place to place and reached every corner of the world. In the past 60,000 to 100,000 years, genes have moved around and mixed and been re-sorted in countless different ways. While a hundred thousand years may seem like a long time, in evolutionary terms, it is the blink of an eye. 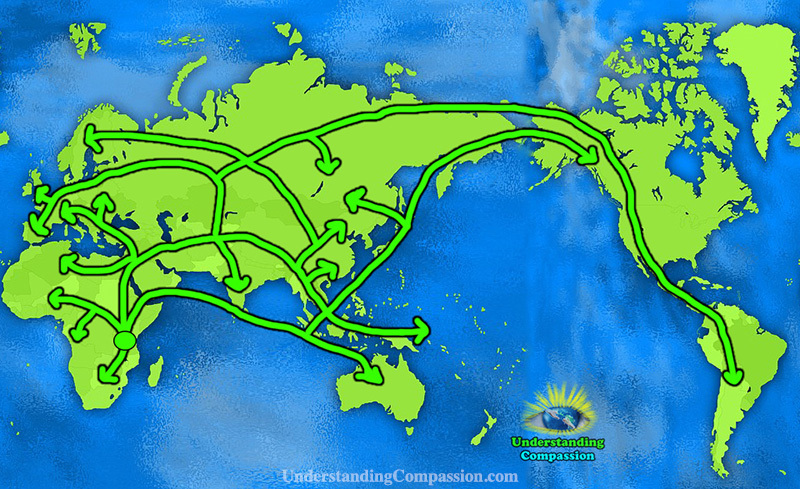 Human populations have not been isolated from each other long enough to evolve into separate subspecies. 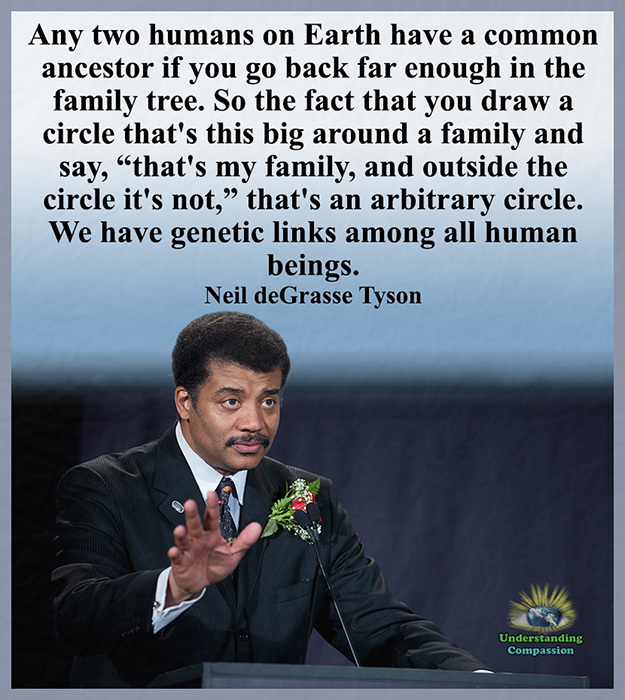 If any notion of the word ‘race’ were true, it would be that there is indeed only one ‘race’; the Human ‘Race’.